I have to apologize for my hiatus again. I recently moved in with two of my friends, so the past few weeks have been just a tad bit hectic, but I promise I am back to clutter your screens with my nerdy word vomit once more. While packing my life away into boxes, I realized I had quite a lot of books I had bought but never mentioned, and what better way to come back than with a little haul! I'm going to break this up into 2 posts because it's a bit of a doozy. Side note: I've always had a ton of books. Ever since I was a kid, I always liked to spend my time with fictional characters rather than actual living people. I could spend hours walking through bookstores or libraries, and I've always had stacks of books in every corner of my room because I ran out of room on my countless bookshelves. In saying that, lemme also just mention, moving said stacks and stacks of books is the pits. Moving boxes filled with books up and down stairs really tested my tiny, frail T-Rex arms. 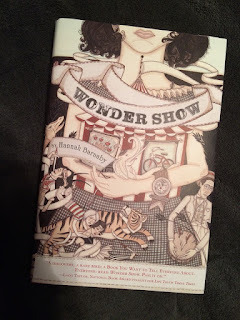 Wonder Show - Hannah Barnaby: I mainly picked this book up because I love anything surrounding circuses circa 1920s-1930s. I had a photography class in college and we looked at pictures of circus performers/circus grounds during that time period and I just fell in love with the look of everything. The story is about a young girl, Portia, who gets abandoned by her father and left with her straight laced aunt. After a while, her aunt then dumps her at the McGreavey Home for Wayward Girls under the care of a creepy man known only by "Mister." While at the home, Portia becomes obsessed with finding out what happened to her father, and she gets this notion in her head that he left her to join the circus. So what's the logical thing to do then? Well, escape the home and join the circus, of course. After the death of Portia's only friend at the home, which Portia feels responsible for, she flees during the night and joins up with a circus that's moving through town. While working there, rather than looking for the family that left her, she starts connecting with the people in the circus (especially the freaks in the sideshow) and begins forming a new family of her own. It's not too long though before Mister has private investigators track her down and force her to return to the house. Once there, Portia learns the fate of her family and after a rescue attempt from her circus family, must decide to either stay at the house or embrace a new life with the strange little family she made. Seinfeldia - Jennifer Keishin Armstrong: I just love anything Seinfeld related and this book was such a fun look into the history, and just how the show about nothing got created. 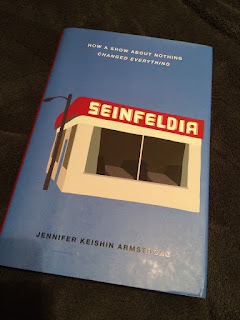 Packed with pictures from writers of the show and tidbits from Jerry Seinfeld and Larry David, it really showcases the struggles the show had in the beginning and how it's now one of the most popular TV shows of our time. The Wicked Boy - Kate Summerscale: Taking place in the summer of 1895, brothers Robert and Nattie, are two teenage kids running around having the time of their lives in East London-- eating at all the fancy coffee shops, taking trips to the theater and whatever else young boys in Victorian London did for fun. 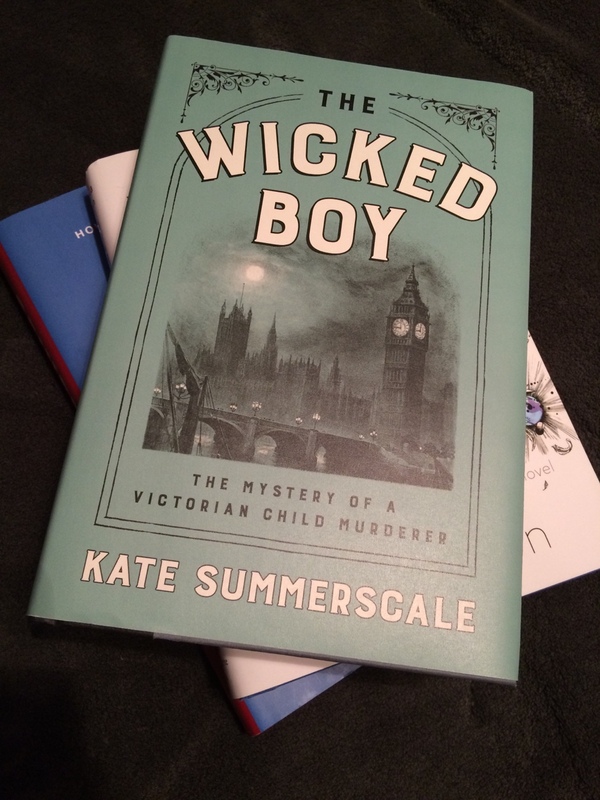 The boys told their neighbors that their mother has left them alone to go visit family, but that arises the suspicions of their aunt who comes to the house only to find the decomposing body of the boy's mother. The two boys are then taken into custody and charged with matricide. Robert confesses to the murder but his lawyers fight that he's clinically insane (uh, ya think?) and Nattie strikes a deal in which he totally throws his brother under the bus. While on trial, it's brought up Robert's love of vicious criminals, penny dreadfuls and that he suffers from severe headaches. Robert eventually gets thrown into a detention center for the insane, which has a profoundly shocking impact on the boy and those who thought they knew him the most. 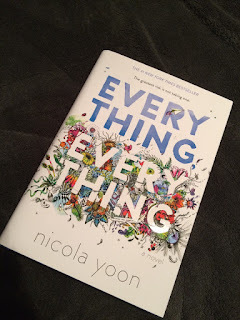 Everything, Everything - Nicola Yoon: This is a story about a girl, Maddy, who is literally allergic to everything. She can't leave the confines of her home, but that doesn't stop her from building a relationship with the new boy, Olly, who moved in next door. The only form of communication they have is through email and the tiny windows of time that Maddy's nurse can sneak Olly in the house while Maddy's mom is at work. Eventually the two fall for one another, and Maddy is determined to be able to live in the outside world with Olly like a normal teenaged girl. Going behind her mothers back, Maddy books a trip to Hawaii for her and Olly, and while there she has a scare and ends up in the hospital. This one event changes everything and flips Maddy's world on its head. Was she ever really sick or was it just her mother's way of keeping her close so nothing bad ever happened to her? It's a story filled with first love and coming of age that's really endearing and heartfelt, and it's played out with little drawings and diary entries so it really feels like you're living it along with Maddy which is refreshing.